In addition to hosting a selection of the top companies leading Dubai and the world into the future of energy and development, including IFFEN, WETEX and the Dubai Solar Show were buzzing with CEOs, innovators, dignitaries, and world leaders. IFFEN’s booth was honored to receive a visit from HH Sheikh Hamdan bin Rashid Al Maktoum, Deputy Ruler of Dubai, Minister of Finance of the UAE and President of DEWA. HH Sheikh Hamdan bin Rashid Al Maktoum spoke with IFFEN’s team and saw their virtual reality training game. 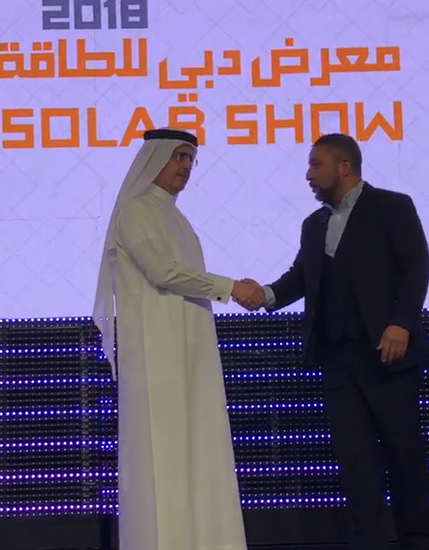 IFFEN director Abdoul Benamer was glad to connect again with HH Sheikh Hamdan bin Rashid Al Maktoum at the WETEX and Dubai Solar Show Gala Dinner to accept the Innovation Prize for IFFEN as the Official Training Partner for 2018.